I will have sections of my blog that I will title “Throwback Adventure”, and will plan on posting them every Thursday. These are journeys we have taken before I started the blog, but are well worth sharing. Many of these Throwback Adventures will include our Buster, who was known for his crazy tail, his happy howl, and his zest for life. We miss him dearly…he is forever in our hearts! In October 2016 Shadow, Buster, My Mom and I Adventured to Glen Ellis Falls in Jackson, in the White Mountains of New Hampshire. Glen Ellis Falls is approximately sixty feet in height and is located on the Ellis River. It is one of the more popular waterfalls of the White Mountains. We had a magnificent Adventure to Glen Ellis Falls on a gorgeous Fall day. The beginning of the walk started under a tunnel and then followed the River before arriving at a lovely scenic spot with beautiful Fall foliage. We were quite pleased to have a visitor take a photo of the four of us at this formal lookout. From there we followed many stairs down to the base of the Glen Ellis Falls. The waterfall was tall and powerful, and just perfect! It was difficult to photograph the Falls as there were many visitors, however we waited our turn to get up close and personal. We sat for a bit near the falls, enjoying the mist on our skin, and handsome fur! After spending some time under the falls we decided to explore the upper level. My Mom first hiked up to the top stairs to check out the views, while Buster and I then took a turn while Shadow hung out with Mom. It was fun to see the waterfall from a different angle, but nothing compared to the main view below. As you may know if you are a follower October 2016 was the last month we would have our dear Buster, creating extra special memories of each and every Adventure on this weekend. Glen Ellis Falls is definitely a place we look forward to exploring again in the future. Really just perfect! I definitely recommend that you visit on your own to see this special Falls. If you regularly follow my blog, and the weekly/video photo I would recommend skipping on to paragraph three, specific to this week’s video/photo. I have decided to add a weekly video/photo section to my blog. This blog will display a video or photo, usually highlighting an Adventure, while I might also sneak in some that are humorous, adorable, or just other fun dog moments. 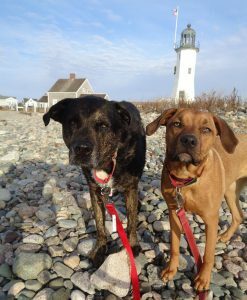 So if you have followed my blog from the beginning you will know that I adopted Shadow as a puppy, and about a year later adopted Buster as a puppy. We had many wonderful years together before experiencing the devastating loss of Buster at just seven. It took a long time for our hearts to heal, but almost a year later we welcomed little Wilma into our world. So my feature video today is a photograph from a Winter moment with Shadow and Buster, many years ago. I have not yet blogged about this park/waterfall, but it is from Trapp Falls, in Townsend, Massachusetts. The Falls is small, and even smaller in the Winter, but still a special local spot. This photograph is a great moment capturing an Adventure as both Shadow and Buster peer back at the Falls. Synchronized, scenic, perfection, all captured in this shot of my handsome boys. We sure do love our Adventures! Glad Buster was able to enjoy many special moments too! Yesterday Shadow, Wilma and I Adventured to Sabbaday Falls. I have blogged about this location previously in my “Throwback Adventure” section, however decided to blog about it again as this was our first visit in Winter. Sabbaday Falls is a popular waterfall located in Waterfall Valley, along the Kancamagus Highway in New Hampshire. There is a short, handicapped accessible travel trail to Sabbaday Falls. Sabbaday Falls is an approximate thirty five to forty five foot drop, ending in a Gorge-like area. The waterfall is made up of a series of cascades. We had a spectacular, icicle-filled Adventure to Sabbaday Falls on a warm, Winter day. This Winter Adventure looked completely different then this location in the other seasons. I was ecstatic to see the parking lot plowed, and a path in place for the hike as I had tried once before to visit this Falls in Winter with no luck. We began our journey up and over a gigantic snowbank, and immediately arrived on the trail. The trail branched over to the stream on two occasions, however not being able to see the rocks or our footing we did not venture too far in that direction. However the mysterious covered stream created a lovely Winter scene with framed circles forming here and there. We continued on the main trail. I suspect the snow was several feet high as I noticed we were walking almost at the top of the railing of a fence, on the groomed snow path. As long as we stayed on the trail we did not sink down, and were able to walk steadily along. It did not take us long to arrive at the Falls. Most of the waterfall was covered with snow, which must have been sitting over the frozen ice. I was pleased that we had been there previously as we would have really not known the “normal” flow of the Falls. The most gorgeous part of the area was some spectacular icicles coming down the rocks, at the bottom area of the cascades. Below the icicles there was a gorgeous rock filled pool with flowing water. I really could not get enough of this special scene. Shadow humored me as he continually tried to dive into the water pool, although wondering if he might get stuck, I decided it best not to swim at this location. He sure is one adventurous water boy! It was really a magical Adventure at this gorgeous location. I would encourage you to visit Sabbaday Falls once in every season as it is just a lovely spot. So glad we were able to get in our winter visit (Rating: 5). In October of 2016 Shadow, Buster, My Mom and I Adventured to the Crystal Cascade in the White Mountains of New Hampshire. Crystal Cascade is a gorgeous waterfall that has a 100 foot drop into the Ellis River. There is just a short walk to the Falls that begins at the AMC Pinkham Notch Visitor Center. The Cascade is along one of the popular routes to Mount Washington. We had a special Adventure to the Crystal Cascade on a beautiful Fall day. Buster had recently been diagnosed with a terminal tumor, and we knew his time was limited. This made the memories even more marked as I recall this lovely Adventure. It was a short walk to the Crystal Cascade with a slight elevation gain. The trail was simple, but perfectly Fall in color. Upon arrival we found a steep, little trail to sneak close to the beautiful Falls. The Falls was singing loudly, and provided a full sensory experience. Buster enjoyed chewing some sticks while Shadow sat and posed for the camera. There were limited spots to view the waterfall, so we were glad to find this spot all to ourselves. We spent some time at the Crystal Cascade before heading past the waterfall to a little bridge across the top. There were absolutely stunning Fall views from this spot with the musical waterfall below below. An absolutely magnificent scene that we thoroughly enjoyed. I was actually planning to visit again this past summer with Wilma and Shadow but the trails were closed due to flooding. However we do hope to visit again on another date. Please see below some photos and videos of our special day at Crystal Cascade. In one of the videos you will see a conversation between my Mom and Buster, as he was a talker, often known for his happy howl. Glad to create special memories on our Adventure to Crystal Cascade. I will have sections of my blog that I will title “Throwback Adventure”, and will plan on posting them every Thursday. These are journeys we have taken before I started the blog, but are well worth sharing. Many of these Throwback Adventures will include our Buster, who was known for his crazy tail, his happy howl, and his zest for life. We miss him dearly…he is forever in our hearts! In some cases you will also see journeys that occurred before our little lady Wilma became part of our family, as in our Throwback Adventure today. In June 2017 Shadow and I had a breathtaking Adventure to Arethusa Falls in the White Mountains of New Hampshire. Arethusa Falls, sometimes referred to as Tuckerman Falls, is sourced by the Bemis Brook. It is almost 200 feet in height and is one of the tallest waterfalls in New Hampshire. The trail to Arethusa Falls is approximately a three mils round-trip hike. Part of the Trail is paralleled by the Bemis Brook Trail while following the Bemis Brook, and leading you past the Bemis Brook Falls and Coliseum Falls. It is a popular area for hiking, and ice climbing in the winter months. One of the most amazing Adventures I have ever taken was this hike I took with Shadow to Arethusa Falls. I remember the trail to the Falls was clearly labeled,filled with rocks, a bridge or two, and other hikers along the way. The main trail was not very inspiring, but the elevation gain was definitely a good work-out. I was super impressed with my rockstar Shadow, (nine at this time) as unlike me, he did not miss a beat! Upon arrival at the Falls we were immediately drawn to the massive height at the Falls. It was thin in depth,and musical in sound, as misty water streamed over the rocks. We hoped from rock to rock finding a nice place to rest, enjoy the waterfall, and eat a little snack. It was definitely one of the most impressive waterfalls I have seen, and the experience of an exhausting hike made the Adventure even better. We relaxed and enjoyed the Falls for awhile before heading back on the main trail. Today Shadow, Wilma, and I Adventured to the Hemlock Gorge Reservation in Newton, and Needham, Massachusetts. Hemlock Gorge Reservation is an urban state park that is approximately 16 acres in size. It is on the Charles River and is especially known for the Echo Bridge, and a waterfall. We had a unique Adventure to the Hemlock Gorge Reservation on this dark and chilly February day. I found this Reservation when planning a visit to the Echo Bridge, soon finding that the Bridge was located in the Hemlock Gorge Reservation. We began our journey following a very simple, snow covered trail. The trail was in close range to the Charles River, located to our right. The trail weaved up and around, soon leading us to a lovely waterfall. The waterfall sang a beautiful song, and was framed by frozen ice, and snow covered icicles, quite the picturesque scene. We enjoyed the sound of the falls, and the winter scene before turning to our left where we saw the Echo Bridge. The Bridge was grand in size, with arches below. We walked to the water’s edge to get a better view as Shadow and Wilma enjoyed the ice and some sips from the River. We then headed to the top of the Bridge and noticed we could walk across the top, displaying a lovely view from above. We met a nice young lady, with a sweet little dog named Charlie. The dogs said hello and she filled us in on the area, which was great as there really was little detailed information available. We then continued over the Echo Bridge, down the stairs, and across the street to the well known platform said to have a special “Echo”. I was completely awed at the grand echo from my voice, and quite humored by the dogs’ reaction looking around as they heard their names. I attempted a video below, but the echo is very faint in the video. It was quite the fun moment, definitely meeting all my expectations from my readings. After enjoying the echo for a bit we headed back to a trail over to the “Island”. We took a wrong turn before finding the trail leading to the “Island”. There was a simple, but beautiful snow-covered bridge crossing over to this location. We walked around a bit checking out the view of the River and the Echo Bridge from afar. The busy roads were not far, reminding us that we were in an urban park, however there were very little visitors making it quiet in its own special way. Although the Hemlock Gorge Reservation was a very simple urban park, it really did exceed my expectations. I still am awed by the echo, loved the walk high atop the bridge, and enjoyed the picturesque winter waterfall. If you are in the area definitely a fun little place to check-out (Rating: 3). Shadow, Buster and I enjoyed many Adventures to an untitled, suspected conservation trail in Sterling, Massachusetts. These particular photos were from our visit in June 2014, although I am guessing I may have other photographs tucked away in my files. We absolutely loved visiting this trail. It was near ponds, streams, up hills, and through the woods. We rarely saw any other hikers and several times even saw beavers on our visits. There was a little waterfall nearby, and lot of spots for the boys to run and swim. It was a special location which really made you feel like you were deep in the wilderness. We often would branch of the trail and find secret spots to explore. It was an amazing and new Adventure each and every time, and carved many fun memories in my heart. So if you are one of my followers, or visitors who is inspired to visit stops on our Adventures, you might be disappointed as I cannot provide you an exact location. However I again encourage you to enjoy your location conservation land. Many spectacular, and quiet spots to explore (Rating: 4).